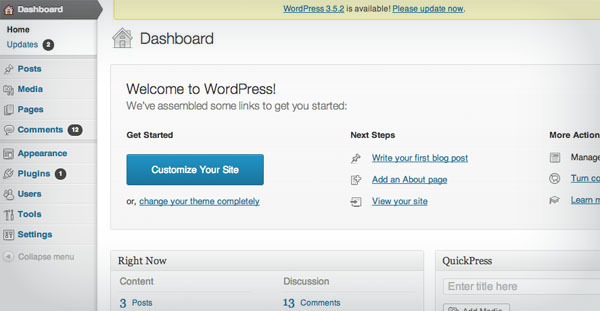 WordPress is undoubtedly the most popular content management system available. And WordPress isn’t just for blogging. As web developers, it allows us to use the robust, user friendly WordPress administration panel to give clients access to their web content. The administration panel is the key to simple and fast development. After installation and setup, web site owners can log in and start adding text and images. The developer can integrate that content into any design whatsoever. In cases where a website owner already has an existing site with a design they like but no access to the content, we can integrate the current design into the WordPress framework as a custom ‘theme’. Elements of the site can be made editable on a customized basis. If for example you only need to edit certain pages, then only that feature will be added which will save time and money. If you need to be able to add or remove pages and have navigation menus updated automatically that can be integrated as well. WordPress can allow you to have control over slideshows and galleries and easily add pictures and video to your pages. You can also have basic online payment systems like PayPal integrated into your site. Of course if you’re are creating a blog style site WordPress is the perfect choice. If you are already an experienced WordPress user you may be looking for features that you can find in any plugins. Or you may have a plugin that doesn’t do exactly what you need it to do. We can develop or modify plugins to suit your needs. Please visit my linkedin profile for current and past WordPress projects.